Anvil! 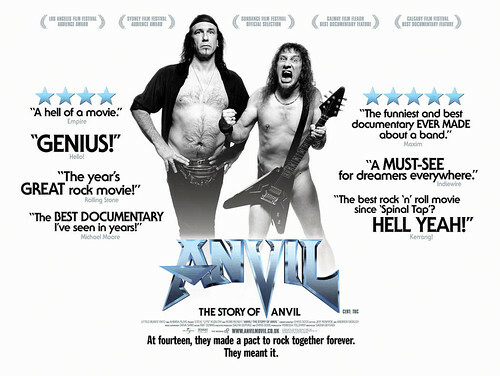 The Story of Anvil: 9 out of 10. I've been looking forward to this one. It just seemed like my kind of documentary. I'm happy to report it was well worth the wait. Anvil! The Story of Anvil is awesome!!!1!1!! Read this little synopsis and tell me you're not intrigued. I dare you. At 14, best friends Robb Reiner and Steve "Lips" Kudlow made a pact to rock together forever. Their band, Anvil, hailed as the "demi-gods of Canadian metal, " influenced a musical generation that includes Metallica, Slayer, and Anthrax, despite never hitting the big time. Following a calamitous European tour, Lips and Robb, now in their fifties, set off to record their 13th album in one last attempt to fulfil their boyhood dreams. Lips and Robb are Toronto boys, full of passion and an unwavering belief in themselves. This story isn't just for fans of heavy metal or Canadian music, it's for anyone who has ever had a dream. I absolutely loved it, and I'm watching it again as soon as I find 90 minutes. You'll laugh, you'll cry, you'll be inspired. I promise. egad! there's an ad for sarah palin's new book on your site. gadzooks! Just watched it, based on your recommendation..
What an incredible movie. Surprisingly moving..
Opera is the antichrist! She is trying to take over the world! She is trying to help motivate the one world government.....! But beneath all this....I can't live without her. She is my muse! Hail Opera!